Learn To Dance Argentine Tango & Modern Ballroom (also Latin & Swing) in Kilmacolm, Inverclyde. 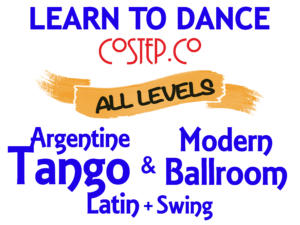 We teach all levels in Argentine Tango & Modern Ballroom; mainly through weekly group classes but also workshops, practicas, masterclasses and private lessons. Our normal weekly group classes also include a short introduction to Latin or Swing; these dance styles may be developed further in other classes etc. If you are new to Argentine Tango or Modern Ballroom then our specially designed Beginners Classes are an ideal way for you to get started. They provide a foundation in these styles of partner dancing. We encourage class members to enjoy the learning experience and progress to further levels at their own pace. If you already have some appropriate partner dance experience you may be able to fast-track your progress and join our Main Classes for Post-Beginner and Intermediate dancers or our small group sessions for Advanced dancers. WANT TO LEARN TO DANCE SWING & SALSA ? Then Join one of our dedicated Swing & Salsa Classes near you. Contact us if you would like more information on any of our classes.